A surprise breakfast each morning is served until 10:00 am. The full breakfast will always be a healthy mixture of fresh fruit, home made baked goods and a hot entree. Of course, you will always find fresh coffee, tea, and juice to start your morning. Please let us know if you have any food allergies or dislikes. Breakfast is generally served in the parlour, but on pleasant mornings the wrap around veranda is a lovely alternative. We will also deliver breakfast to your room on a tray for an additional $15 per room. 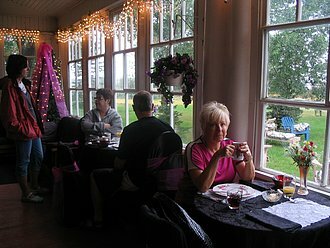 All three locations provide a peaceful space for a hearty Saskatchewan breakfast.